1 of 2 Whisk flour, baking powder and salt in a small bowl. Beat butter, sugar, egg, egg yolk and vanilla in a large bowl until blended. Stir in flour mixture. Gather into a ball; wrap in plastic. Refrigerate 2 hours. 2 of 2 Heat oven to 350 degrees F. Roll out dough with lightly floured rolling pin on lightly floured surface to 3/8-inch thickness. Cut with 4-inch snowflake cookie cutter. Place on ungreased baking sheets, 1-1/2 inches apart. Bake at 350 degrees F for 10 to 12 minutes, until lightly browned at edges. Remove cookies to rack to cool. 1 of 1 In a medium-size bowl, combine confectioners sugar, powdered egg whites and 2 tablespoons cool water. Beat on high with an electric mixer for 5 minutes, adding more water as needed for good piping consistency. Divide in half; tint half blue. Transfer icings to two separate pastry bags fitted with small writing tips. 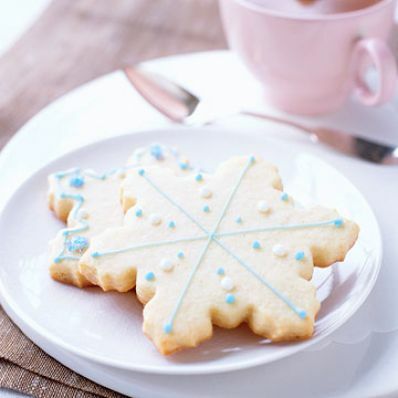 Decorate cookies with icing; sprinkle with sugar and nonpareils. Let icing dry 1 hour before stacking cookies. Per Serving: 48 mg sodium, 0 g fiber, 3 g sat. fat, 25 g carb., 2 g pro., 34 mg chol., 5 g Fat, total, 153 kcal cal.